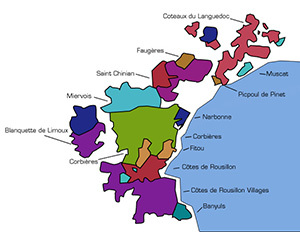 Languedoc is the largest French wine producing area. It is also one of the most exciting regions, in the sense that the production migrated in 20 years from bulk wine to quality products. The region host a wide variety of wine coming from the traditional “Mediterranean” varietals (syrah, Grenache, carignan, mourvedre, cinsault) to other grapes such as the Bordeaux blend (merlot, cabernet franc, cabernet sauvignon). In addition, the variety of soil (schist, pebbled terraces, sandstone, marl, limestone, alluvium) gives the wines their distinctive character. Wine was introduced in the region by the Greeks during the 6th century BC, but was effectively developed by the Romans. The opening of the “Canal du midi” in 1681 as well as the development of railroads have contributed to promote the growth of viticulture in the region. Today, the region is dominated by the production of red wine that benefits from the Mediterranean climate, with high summer temperatures, sporadic rainfall, and strong winds.